Many of the pictures and images of Native Americans depict the Indians in full war paint. Many tribes of Native Americans painted their bodies and faces for rituals, dances and for battle. The designs painted were believed to hold magical powers, such as the Thunderbird. The Native American Indians believed in a powerful spirit called the Thunderbird. The Thunderbird is a huge, legendary creature in the history of many of the indigenous people North American especially in the cultures of the Northwest Coast, Great Plains Indians and Southwest Indian tribes. The legend of the Thunderbird is derived from the common belief that the creature creates storms and the beating of its enormous wings causes thunder and stirs the wind. Lightning was believed to flash from its eyes or beak. The Sioux Indian name for the Thunderbird is is Wakyą which translates as wakha, meaning "sacred" and kįya, meaning "winged". The Thunderbird was believed to live in nests of stone on the tops of high mountains which were constantly shrouded in clouds. The mortal enemy of Thunderbird was the Great Serpent who lived below the waters. The lightning bolts of the Thunderbird were used to try and tame him. The Thunderbird is known as the Skyamsen to tribes of the Northwest and is revered as the dominating force of all natural activity. The Thunderbird has an important role in the creation myth as a Destroyer and Controller of Nature and it was believed that the Thunderbird must be honored and appeased. As a destroyer this legendary creature was viewed by some tribes as an omen of war when the sound of thunder was heard. Thunder was believed to be a sign the spirits were at war in the skies but this also foretold of victory for tribal wars fought on the ground. 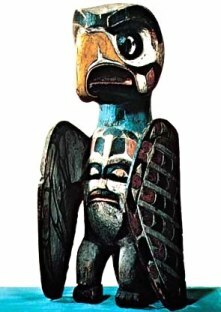 The thunderbird was often portrayed with an additional head on its abdomen, especially on Totem poles and carved figures, as shown in the adjacent picture. The thunderbird was frequently accompanied by less important bird spirits. Thunderbirds were particularly sought as guardian spirits because of their powers. In Native American Indian mythology the thunderbird was believed to possess the power to water the earth and make vegetation grow, it controlled the weather. The famous Sun Dance, also referred to as the Rain Dance, centred around the mythology and legend of the Thunderbird. During the dance the Indians danced around a central pole. At the top of the pole was the nest of the Thunderbird. The Sacred Thunderbird was represented by the mighty Eagle who is the messenger for prayers sent to the Great Mystery or Great Spirit.